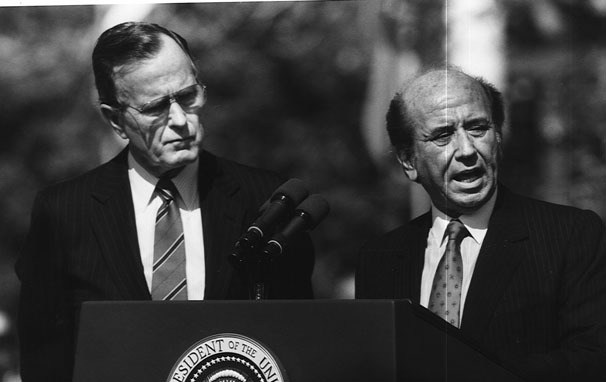 President Carlos Andrés Pérez appears with President george Bush during a visit to Washington. Former President Luis Herrera Campins effectively described Venezuela's position in the world when he stated that, "Effective action by Venezuela in the area of international affairs must take key facts into account: economics--we are a producer- exporter of oil; politics--we have a stable, consolidated democracy; and geopolitics--we are at one and the same time a Caribbean, Andean, Atlantic, and Amazonian country." After the emergence of a democratic system in 1958, a number of Venezuelan presidents have stated the basic principles that guided their foreign policy. These principles included respect for human rights, the right of all peoples to self-determination, nonintervention in the internal affairs of other nations, the peaceful settlement of disputes between nations, the right of all peoples to peace and security, support for the elimination of colonialism, and a call for significantly higher export prices for developing countries' primary products, especially oil. Throughout its history, Venezuela's foreign policy also has been infused with Simón Bolívar's ideal of promoting the political and economic integration of Latin America. In the democratic era, Venezuela has attempted to fulfill these principles through a variety of means. It maintained active membership in the United Nations (UN) and its related agencies, OPEC, the Organization of American States (OAS) and its related entities, the Latin American Integration Association, and a host of other world and hemispheric organizations. In all these forums, Venezuela consistently aligned itself with other democracies. Although Venezuela has been particularly active in the circum-Caribbean area, its foreign policy also has global dimensions. The first two presidents of the democratic era, Rómulo Betancourt and Raúl Leoni, took courageous stands against tyrannies of the right and the left. Although motivated in part by idealism, these foreign policy positions also responded to the pragmatic need to defend the nascent democracy from foreign intervention. Both presidents saw their country repeatedly subjected to propaganda attacks and actual armed incursions directed or inspired by Cuban leader Fidel Castro Ruz. Although Betancourt and Leoni took a particularly harsh line against Cuba, they expressed equal criticism of the right-wing dictator Rafael Leónidas Trujillo Molina of the Dominican Republic, who nearly succeeded in engineering Betancourt's assassination in June 1960. The Betancourt Doctrine, whereby Venezuela refused to maintain diplomatic relations with governments formed as a result of military coups, was adhered to by both administrations. Although the doctrine was much praised, it gradually isolated Venezuela as most other Latin American nations became dominated by nonelected regimes. Slowly but surely, the doctrine was modified in the late 1960s and early 1970s, allowing for the reestablishment of diplomatic relations with Argentina, Panama, Peru, and most communist countries. In December 1974, President Rafael Caldera announced the normalization of relations with Cuba. Relations with neighboring Guyana have been strained for decades by Venezuela's claim to all territory west of the Essequibo River, more than half the present size of Guyana (see fig. 9). A 1966 tripartite agreement in Geneva established a Guyana-Venezuela commission to discuss the dispute. In 1970 President Caldera agreed to a twelve-year moratorium on the issue. The dispute was, with the concurrence of both parties, referred to the UN Secretary General in March 1983 for a determination of an appropriate means for settlement. There appeared to be some prospect for improved relations between the two countries during the 1990s. One auspicious indication of this was the talks between the foreign ministers, held both in Venezuela and Guyana, in early 1990. The ministers not only discussed the lingering territorial question, but also committed their governments to greater cooperation in a number of fields, including energy and health. Guyana has expressed interest in importing electricity from Venezuela's mammoth Guri Dam; both countries shared concern over the control of tropical diseases. Relations with Colombia have also been intermittently tense during the last half of the twentieth century. Caracas and Bogotá have been engaged in a long dispute regarding sovereignty over the Golfo de Venezuela (or the Golfo de Guajira, as the Colombians refer to it). Tensions arising from the dispute contributed to a high-level military alert following the intrusion of a Colombian ship into Venezuelan territorial waters in August 1988. Both countries managed to back away from the brink of open conflict over the incident; in March 1989, the two presidents met at the border to discuss this and other points of contention, most of which arose from the closely linked frontier economies along the vast land border. Venezuelans consistently assumed that most Colombians living in their country were indocumentados (undocumented or illegal aliens) and routinely accused them of a variety of crimes, real or imagined. A constructive outcome of the presidents' meeting at the border in 1989 was the creation of a five-member international conciliation commission, headed by Adolfo Suárez González, the former Spanish prime minister, and including, among others, two former Latin American presidents. Three bilateral commissions were also established to study specific issues. The intensification of drug trafficking added a new urgency to better cooperation between the two countries. Most observers believed that relations improved after 1989 and that intergovernmental cooperation in controlling narcotics trafficking and guerrilla activities along the border expanded. Colombian president Cesar Gaviria used the occasion of his August 1990 inauguration to meet with President Pérez and to reconfirm Colombia's commitment to the agreements signed by the border commissions. For his part, Pérez stressed the need to continue regular meetings between the two heads of state in order to maintain coordinated efforts not only on the resolution of border issues but also in the formulation of regional foreign policy and economic integration efforts. Under the first Pérez administration (1974-79), Venezuela provided matériel, support, and advice to the Sandinista National Liberation Front (Frente Sandinista de Liberación Nacional--FSLN) during its struggle to oust the dictatorship of Anastasio Somoza Debayle in Nicaragua. President Herrera, who subsequently led the Andean Common Market ( Ancom; see Glossary) efforts for a peaceful transition of government in that Central American nation, became increasingly disenchanted with mounting political repression under the Sandinistas. In 1983 Venezuela joined with Colombia, Mexico, and Panama to seek a regional solution to Central America's problems through the Contadora Group (see Glossary) process. In his second administration, Pérez helped to push the Sandinistas into allowing the democratic elections of February 1990, in which opposition candidate Violeta Barrios de Chamorro defeated Daniel Ortega of the FSLN and became Nicaragua's president. Venezuela bolstered its commitment to Chamorro's government by sending nearly 1,000 soldiers to participate in the UN peacekeeping mission in Nicaragua. This was the first time that Venezuela had sent troops outside the country to demobilize warring factions. In a more traditional vein, Venezuela also cancelled Nicaragua's US$143 million oil debt and resumed oil shipments to the Central American country. Venezuela had suspended its oil trade with Nicaragua in 1982 as a result of that nation's default in paying its oil import bill; the cutoff was also intended to signal Venezuela's disappointment with the lack of progress toward democratic government in Nicaragua at the time. Apart from their differences in relation to Nicaragua and Venezuela's strong support of Argentina during the 1982 Falklands/Malvinas conflict, relations with the United States have been generally close. The minor tensions between the two countries have been exacerbated by trade issues; Venezuela's main objections in this regard concerned United States import policies, which, in the Venezuelans' opinion, raised excessive barriers to Venezuelan products. Also in the economic sphere, the fact that most of Venezuela's foreign debt was owed to United States banks represented a major point of continuing contention between the two countries. From the United States perspective, Venezuelan efforts at economic reform under President Pérez provided opportunities for an expansion of ties, particularly in the area of foreign investment. To the surprise of many analysts, Pérez, who in his first administration (1974-79) assumed a cool, almost hostile stance toward foreign investment, proved much more favorably disposed to foreign capital in his second term. His administration removed previous limitations on the remittance and reinvestment of profits by foreign companies. The government also approved majority foreign control of companies in several sectors previously closed to foreign investment, such as public services, domestic transportation, and export services. Although the administration hinted at the possibility of foreign participation in oil exploration and refining, it did not immediately enact such measures. After decades of restrictions, however, the new regulations generally opened the local capital market to foreign companies and promised a reduction in the government's discretionary interference in foreign investment decisions. Because of its long democratic tradition, as well as its support for democratic institutions in other countries, Venezuela was respected and considered a leader among the Latin American nations. It maintained good relations in the Third World, although it had few commercial or other close ties with Third World nations. Venezuela also maintained relations with the Soviet Union and the countries of Eastern Europe and strongly supported the political openings there beginning in the late 1980s. In many ways, Venezuela often felt as close to Western Europe as it did to the United States, but the nature of these relations changed according to who held power in Caracas: AD administrations tended to pursue close ties with the socialist and social-democratic parties and governments in Europe; COPEI governments established close ties with the Christian democratic and more centrist parties and governments of Europe. Venezuela's domestic breakthrough in 1958 to a functioning democratic system was soon reflected in the conduct of its foreign policy. As that system grew stronger, and as the nation's economic status improved along with rising oil prices in the 1970s, Venezuela's role on the world stage became a more prominent one. Venezuela was a founding member of OPEC, and has exercised a responsible role within that organization. Outside of OPEC, Venezuela acted during the 1980s to supply oil to the emerging democracies in the Caribbean in an effort to ease the burden of these often heavily indebted nations. Venezuelan diplomacy also vigorously supported the establishment and strengthening of democracy in the Dominican Republic and in Central America. As a member of the Contadora group of nations dealing with the Central American crisis of the mid-1980s, Venezuela advocated the establishment of democratic systems and procedures in the region as the most beneficial solution both for the countries involved as well as for Venezuela's own political and economic interests in the region. In the UN, the OAS, and other Third World forums, Venezuela has consistently sought to advance the same basic goals, namely democracy and development. The future course of Venezuela's foreign policy, regardless of its direction, will undoubtedly depend upon the status of these two factors: the stability of the governmental system and the state of the national economy. The nation's commitment to the overarching principle of representative democracy appeared to be unalterable.